A bone-in ham steak is a thick cut of ham, resembling a piece of steak from a cow. It is an easier and faster way to enjoy the taste of ham, without having to slow-cook a whole ham. A ham steak can be cooked numerous ways for different flavor dimensions. It is high in sodium since it is cured, like a whole ham, but goes well with fruit, mustard, honey, brown sugar, mashed potatoes or vegetables. Grill the ham steak for five minutes. Brush the top of the ham steak with your favorite glaze and turn over on the grill so the glazed side is down. Grill for five minutes and brush the top of the ham steak with the glaze. Turn the steak over and cook for another five to seven minutes. Preheat a large skillet over medium heat with 1 tbsp. vegetable oil. Season the ham steak, if desired, with your choice of herbs and spices. Cook the ham steak for six to seven minutes. Turn the steak over and cook for another six to seven minutes. Coat the ham steak with herbs and spices or a glaze. Place the steak into a baking dish, uncovered. Cook the ham steak for about one hour. 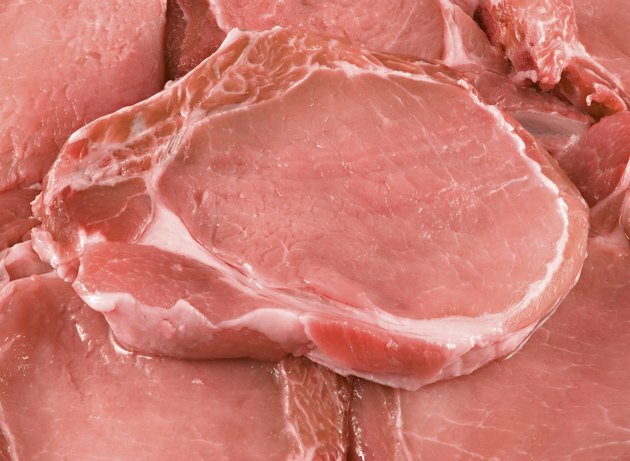 The internal temperature of cooked ham steak should reach 145 degrees Fahrenheit. Store cooked ham steak in the refrigerator for three to four days and in the freezer for three to four months. Create a glaze with ½ cup of your choice of fruit preserves and 1 tbsp. of your choice of mustard, melted over low heat for two minutes. Add garlic, lemon juice or chopped fresh herbs to the glaze as well. Instead of a glaze, season the ham steak before grilling and top with a homemade sauce of honey, brown sugar and apple cider. A 2-lb. bone-in ham steak will make four servings.